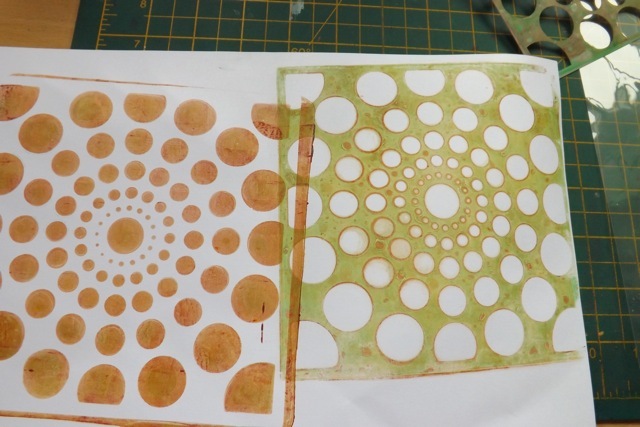 Using watercolours on a Gelli Plate! This is something I have been thinking about for a while. I did try it once before, with mixed watercolours, but it didn’t work well. 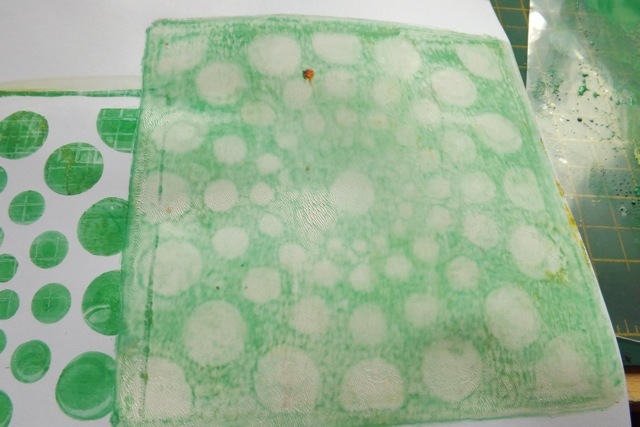 The reason, I think, is that the super-wet watercolours, either mixed from one of the hard watercolour blocks, or the tube watercolours mixed with too much water sort of bead up on the Gelli plate. I did it differently. I squeezed a blob of concentrated watercolour onto a slick report cover then spritzed on a tiny bit of water to get it to a creamy, more like acrylic paint, consistency. That I was able to brayer onto the plate with no problem. It may LOOK like the colour is patchy, but check out the prints! I think the watercolour paint holds really well UNDER the stencil, so the prints first thru it, then after removing the stencil, both look crisp. You can see it works well on Deli paper too. One of the things I really like is that if the paint dries on the report cover, if you aren’t keen on making 10 prints all in one colour (cause really a little bit goes a LONG way) all you need to do is spritz the barest hint of water on it to re-activate the paint. I imagine you could store the painty sheets to pull out and reactivate later if you have the space for that. I even did a clean-up print with acrylic paint OVER the “dirty” watercolour plate, which gave a fairly misty print. And on this print I clearly laid the same stencil down in almost exactly the same place, unthinkingly, and got the almost shaded print you see. I love that one. OK, so a couple of points. What is the difference with watercolours? 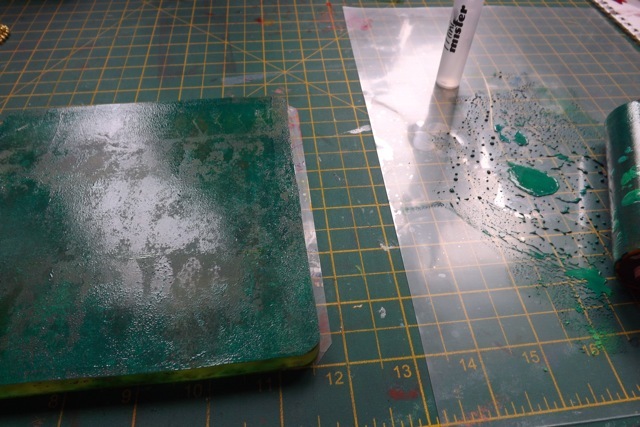 Well, with the acrylic paint you get a toothy print – it has texture. The watercolour prints are as smooth as a baby’s bottom, as smooth as the paper they are printed on. Prints of something with a pattern or something like book pages, and the effect is sheer, more like acrylic paint with a glaze medium mixed in. And it stays wet longer. On the down side, my belief is that it is likely to be more expensive. Acrylic paint is CHEAP. My watercolour set was cheap too, but lots of the tubes are a bit dried out, some of them are a little gummy and need to be “creamed” like butter and sugar to get them to the right consistency. I forgot to take a picture of it, but one interesting thing is that after you do the watercolour pull you can let it dry then mist it so the paint runs a bit, for a very drippy looking print with the stencil areas still visible. 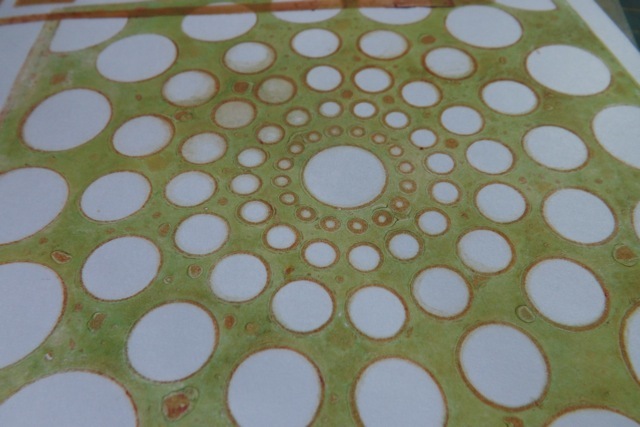 Also note that as you are working on a separate sheet to apply the paint, rather than applying it directly to the plate, multi-colour prints take planning. And you need space for multiple sheets. I suspect it would be possible to add the paint directly onto the plate with better, or at least FRESH, rather than 3 years old, tubes! And the plate cleans up perfectly with water. Def. something to play with a bit more, I think. I certainly like some of the pulls for ATC backs or maybe card backgrounds. They will go in my stash to be pulled out and incorporated into other projects as they fit. Categories: art, Gelli plate monoprints | Tags: Gelli plate, watercolor paint | Permalink.